I really enjoyed your video tutorial, it was super helpful! I’ve been anxiously awaiting a tutorial on the waves border since you posted a picture on instagram. It really is beautiful, and so unique! Love it. Thank you! I hope I can create more videos for the blog. It’s such an interesting medium to work with. Wonderful! Thank you for the feedback on the video. The blanket is sitting on a chair in her living room and gets used a lot by her grandbabies, so I know she loves it. Great video! it was clear, on point, easy to follow and you sounded fine! Thank you for posting it. I love the wave pattern, watched the video twice and wrote down the steps. I have an afghan I just completed about a year ago, and noticed the other day the border just did not look right. I’m going to take it off and add this wave border to it. Since the room this afghan is in is “Beach Themed” , it will be perfect! Thanks for sharing. Thank you for the video feedback! I was so nervous posting it. The waves are definitely perfect for the beach theme! Thank you! I thought it was too pretty not to share. Love this border. Am always looking for the right finish for projects. And, well done on the tutorial. Thank you. Thank you for the feedback! I am currently looking for a lacy border for a Christening blanket. The search never ends. You have created a beautiful border on a beautiful blanket. I really love the color of yarn. 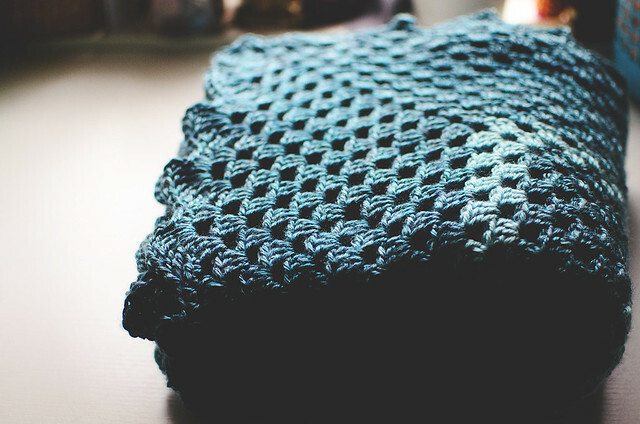 Love your prayer shawl. We have been trying to get a group from our church started to do shawls for people in our community/families. This gives me inspiration to keep trying to make that happen. I had one question to ask, what weight yarn did you use in your shawl? It is really beautiful. Thank you for posting and adding instructions! Thank you so much. I linked to the yarn at the end of the post, but it’s Lion Brand’s Heartland yarn. It’s worsted weight. This is such a beautiful design! 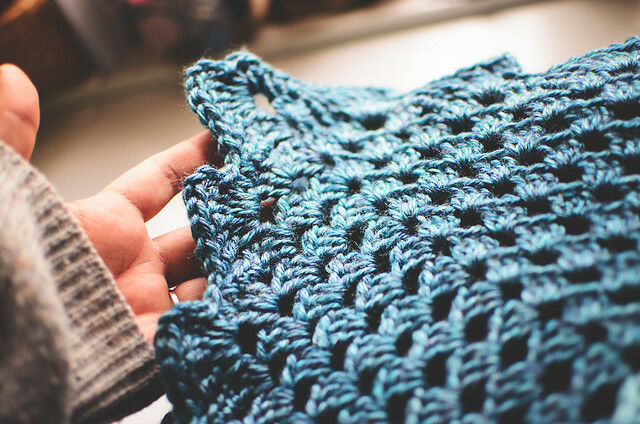 I am an avid knitter, and haven’t crocheted in years. 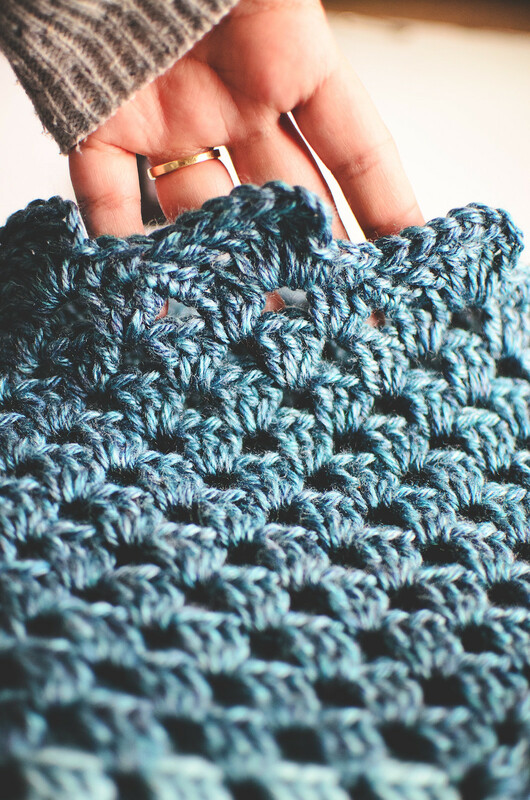 Your pattern has inspired me to pick up a crochet hook and recreate your design! 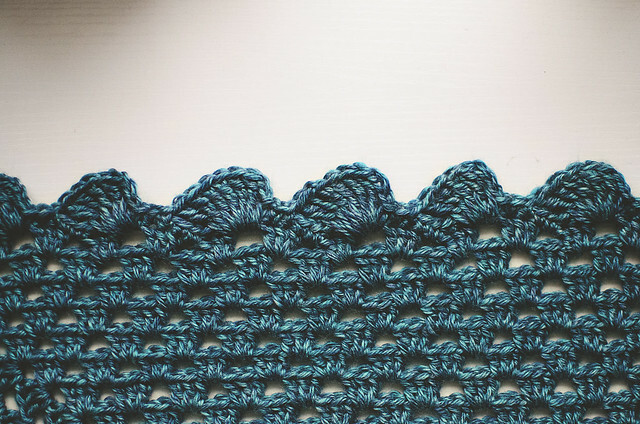 The edge is gorgeous and I can see using it to edge knitted items too. I remember having a giant granny square blanket around the house when I was a child. I am fairly sure we wore it out, because it was the favorite blanket to snag on cool evenings. Bravo, Lisa! My one question is how many skeins of yarn did it take to make the design that you have pictured? The color is awesome too! Oh, wonderful! I’m so happy you’ll be crocheting again! That’s some useful information I could add to my post. I used just under 5 skeins of Heartland. The contrasting color, which you can barely see in the photo, was a skein of Red Heart Soft. If you don’t want to use it, you should probably get an extra skein of Heartland, to be sure you have enough. Thank you for sharing this!!! It helps me to see what to do! This was very interesting and I loved the back ground music.